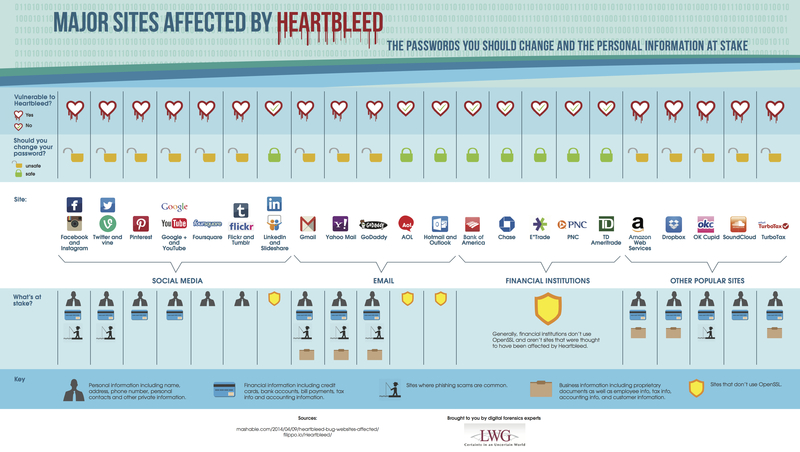 The Heartbleed security flaw was fixed in the newest version of OpenSSL, but you should still change your passwords on all of the sites affected by the bug. If you’re still not sure which sites were affected, we have the perfect chart for you, created by the “digital forensic specialists” at LWG Consulting. Major sites ranging from Facebook and Google to Pinterest and Flickr were affected. Luckily, many financial institutions were not. Click here for the full size graphic. Most recently, a report emerged alleging that the U.S. National Security Agency had known about Heartbleed for more than two years, and even exploited it. The NSA later denied the allegations.